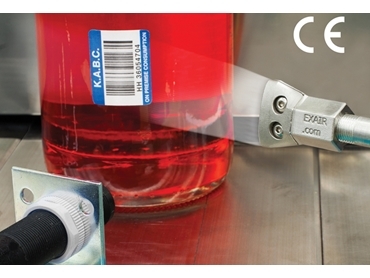 EXAIR’s new PEEK Atto Super Air Nozzle is engineered to produce extremely high performance from a tiny nozzle. 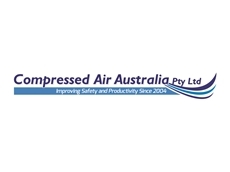 Compressed Air Australia Pty Ltd presents a new and powerful range of flat air nozzles designed for tight spaces and tight budgets. 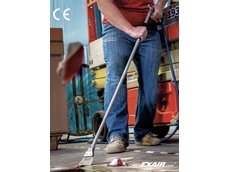 EXAIR has introduced a new 1" stainless steel flat Super Air Nozzle designed as an ideal fit for tight spaces and tight budgets. 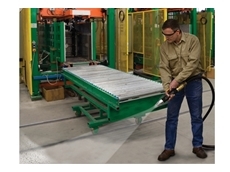 The new Super Air Nozzle produces a flat 25mm wide airstream with a strong blowing force of 278g when mounted 305mm from the target, using EXAIR’s patented technology to maximise entrained airflow while reducing noise levels. The unique design of this super-efficient nozzle makes it an ideal fit for tight spaces while the Type 316 stainless steel construction is suitable for corrosive, high temperature, food and pharmaceutical environments. 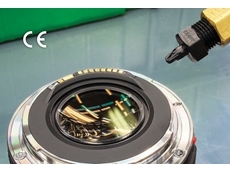 A precise amount of air is released through the 0.38mm air gap opening that is set with a stainless steel shim positioned between the body and removable cap. The high velocity airstream pulls in surrounding room air to produce a wide, forceful stream of laminar airflow. Air consumption is 10.5 SCFM at 80 PSIG. 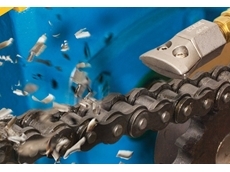 Force and flow may be easily adjusted by installing different shim thicknesses. Distributed by Compressed Air Australia Pty Ltd , EXAIR’s 1" flat Super Air Nozzles are also available in zinc aluminium alloy construction for use in rugged industrial applications including ejecting heavy parts and slugs, chip removal, part cleaning, drying, liquid blowoff and cooling.